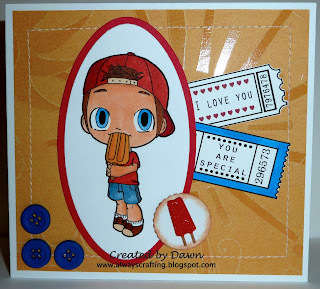 Today we have a fun challenge at One Stop Craft Challenge blog. For this challenge use a sticker or two on your project. Please head over to www.onestopcraftchallenge.blogspot.com and enter your project today! I used Popsicle Tobie for my image from Some Odd Girl. I really wanted to use a summer theme for my card and I had some cute little popsicle stickers that went perfectly with this image. The paper has suns all over it so that worked in perfectly too.